Did you know all your activities on the Internet can easily be tracked? When you browse the Internet, the Internet Service Provider assigns your computer with an IP Address. The IP address is unique to your computer and can help locate you as well as trace your Internet activity. But did you know there are ways to conceal your IP address? Read on learn more about how to hide your IP address and protect your privacy. There are many reasons to hide IP address. Some may need it to remain safe online and protect themselves from hackers. Some may need to prevent themselves and their loved ones from online frauds. At times, businesses need to protect their identity and hide their moves online from competitors. Today, data mining on websites is a very large business and thus, requires one to maintain Internet privacy. A few users need to hide their geographical location in order to access certain websites blocked by their country or other countries. Hiding IP address also prevents one from leaving their digital footprint online. There are a few ways to hide your IP address. Let us look at the common ways to hide IP and protect your identity online. 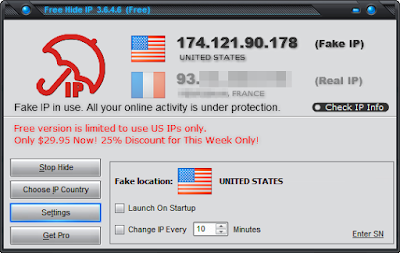 Another popular way to hide IP address is using a website based proxy server. These are site based proxy servers, so you do not need to install any software on your computer. However, keep in mind some of these proxy servers are not safe to use, as they do not offer secured connection (SSL). The other method to hide IP address is by choosing any one of the open proxies available on the Internet. These freely available proxy servers provide you with an IP address and configures your browser so that the original IP remains hidden. However, as these are open and freely available, they are too slow to perform. Using either of the above three methods, you can hide your IP address. Choosing a VPN proxy will ensure that you remain safe and hide your IP address successfully. Any other method is a bit risky and one should refrain from doing any financial or private browsing on such proxy servers that makes one vulnerable to attack.